In 1992, the Harvard-based political scientist Samuel Huntington suggested that future conflicts would be driven largely by cultural differences. He went on to map out a new world order in which the people of the world are divided into nine culturally distinct civilizations. His argument was that future conflicts would be based around the fault lines at the edges of these civilizations. He published this view in a now famous article called “The Clash of Civilizations?” in Foreign Affairs. credit: Bogdan State et al. Now Bogdan State at Stanford University and associates have analyzed a global database of e-mail messages and their locations, sent by more than 10 million people over the space of a year, MIT Technology Review reports [link to original article]. 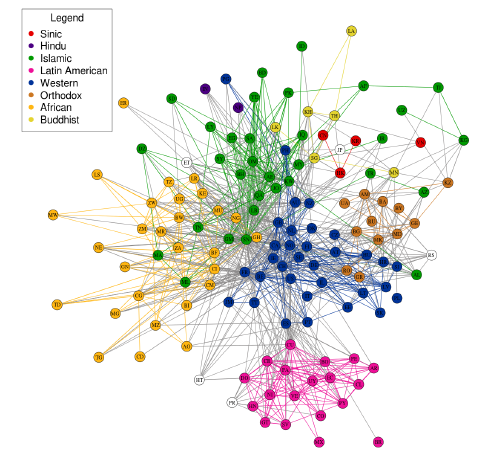 They say he global pattern of connections reflects the cultural fault lines thought to determine future conflict, clearly reflecting the civilizations mapped out by Huntington. To do a dull thing with style is preferable to doing a dangerous thing without it. out of the bathroom naked without seeing me. Beautiful. No cheesy music: just a camera, a pair of NASA F-18s, the NASA’s 747 Shuttle Carrier Aircraft and the orbiter Endeavor. Go full-screen HD! This summer I was lucky enough to attend some amazing Bruce Springsteen concerts. In Milan, the San Siro arena was packed. No less than 70,000 people waiting the whole day for Bruce and the E Street Band to come out on stage. Then the lights went down. Almost immediately, thousands of hands went up, and not (only) to applaud. They were holding softly glowing screens. Cameras and smartphones, not necessarily in this order, all straining to capture the show. Although I’ll be the first to admit that I’m a social media addicted, I tend to limit myself to a snap or two at the beginning or end of a performance, trying to keep my focus on the show and not be distracted by Twitter, Facebook or Instagram. At this show, however, I noticed something different. With the notable exception of someone for whom, apparently, gig recording is a second job, people appeared to be trying to carve in digital form not the show itself, but the mood of the most memorable moments of the show. Suddenly, I realized that instead of trying to obsessively document the night, Bruce’s fans were interested in capturing small snippets of the show to serve as a placebo in the future. The videos could augment that physical recollection of the night, rather than serve as a replacement for it. This could be a sign that we are now in a sort of “memories overdose”: because of digital data and networks, we are in a situation where the amount of memories we can reasonably review has exceeded our capacity. Just take a look at YouTube statistics to see what I mean. Or not? The U.S. Air Force has released an impressive video on accelerating change, “Welcome to 2035…the Age of Surprise” (see below). We can predict broad outlines, but we don’t know the ramifications. Information travels everywhere; anyone can access everything — the collective intelligence of humanity drives innovation in every direction while enabling new threats from super-empowered individuals with new domains, interconnecting faster than ever before. Unlimited combinations create unforeseen consequences. Maybe it is just PR and nothing more, or another article about predicting history today, but the video is definitely cool. Turn up your sound, and go HD full-screen!